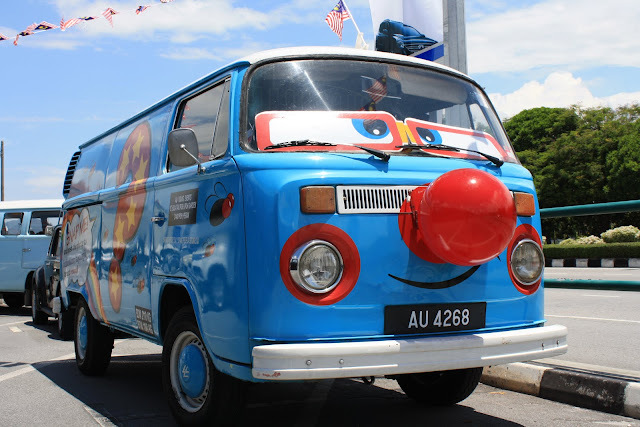 Yes, today is the last day of August, and it's the 54th birthday of this nation called Malaysia. 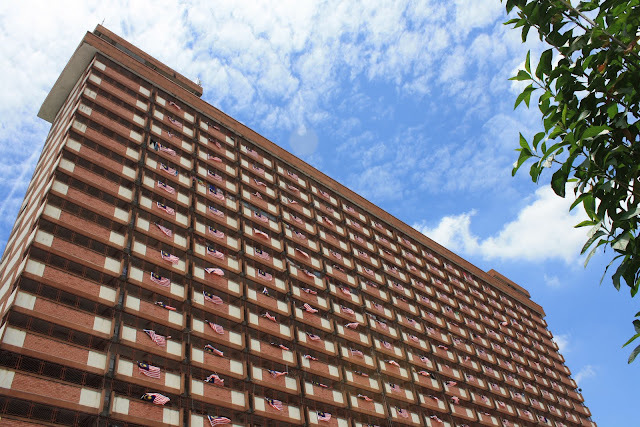 Flying flags has become a tradition to celebrate the independence day. 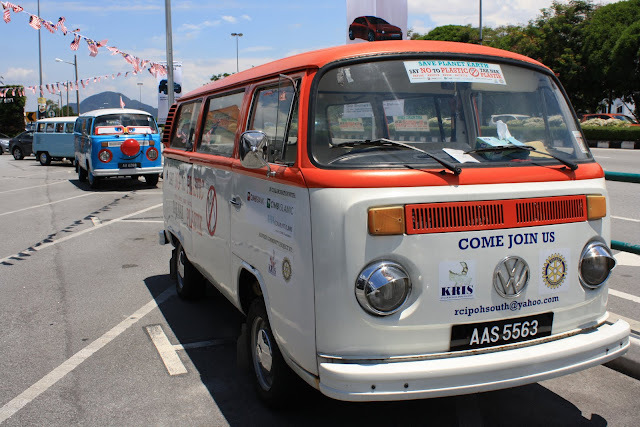 Kinta Heigths is seen with lots of Malaysia national flag "Jalur Gemilang". 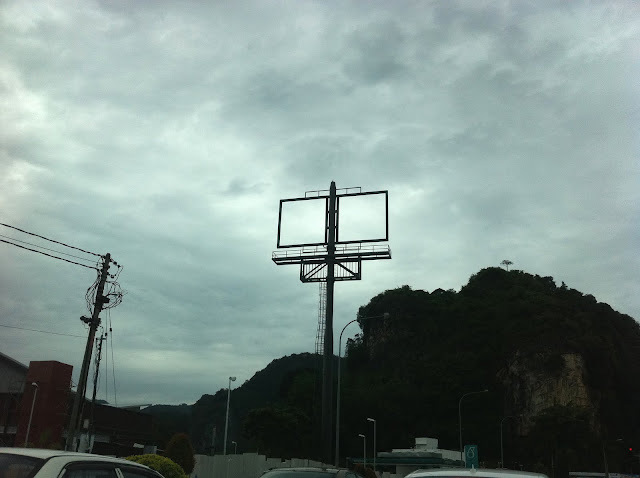 I was driving towards south and passing by Gunung Rapat. When I saw this rocket-like post & it looked so familiar. 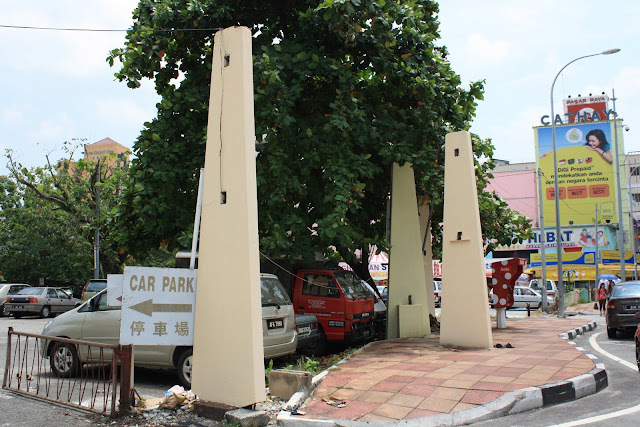 This is the same structure appears in Tasek's KFC & Pizza Hut outlet. It seems Gunung Rapat will continue with the battle of fast food, after having McDonald's, Station One, Secret Recipe, Domino's Pizza, Burger King & Old Town. 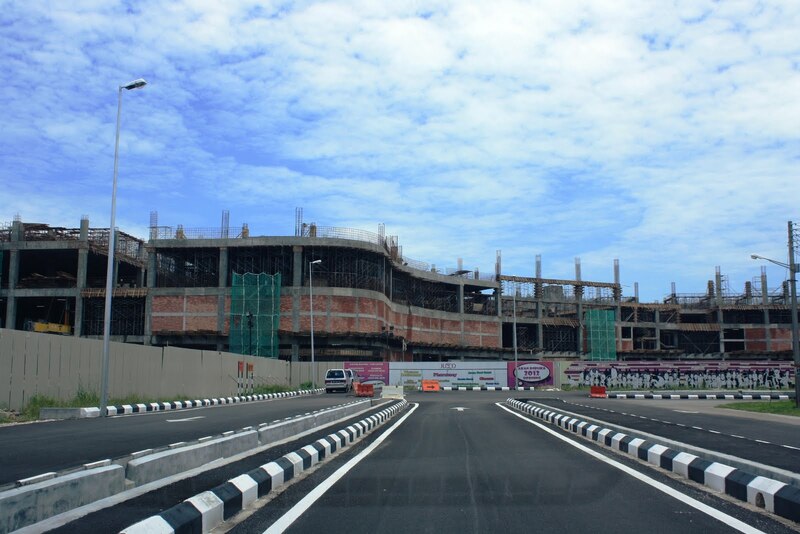 Gunung Rapat, as the southern gateway to Ipoh is now growing to be another hot spot apart from Ipoh Garden, which is at the northeast. 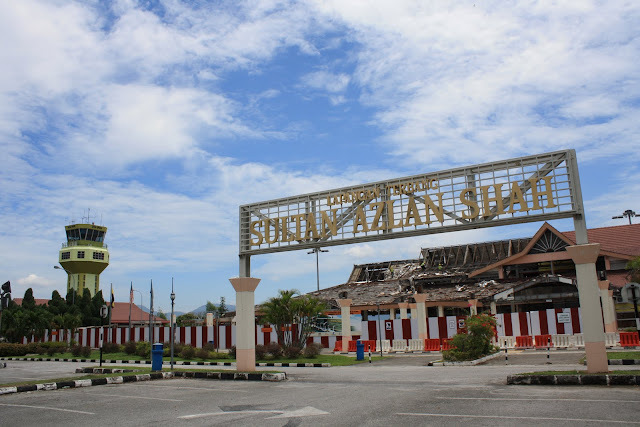 Long holiday, what would be the most welcome activity in Ipoh? The answer is eating & shopping. 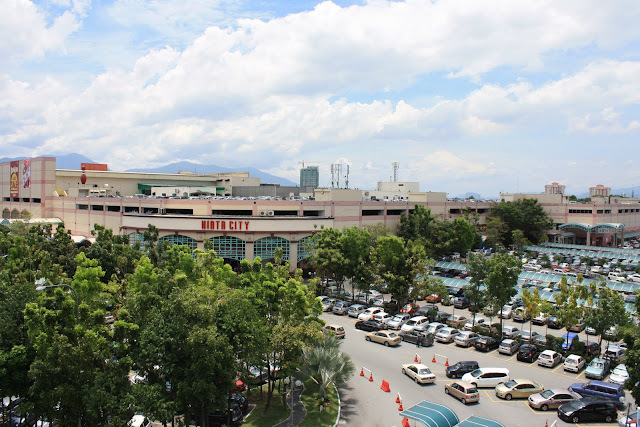 Apart from enjoying tasty local food of Ipoh, spending time in shopping mall is almost a must. 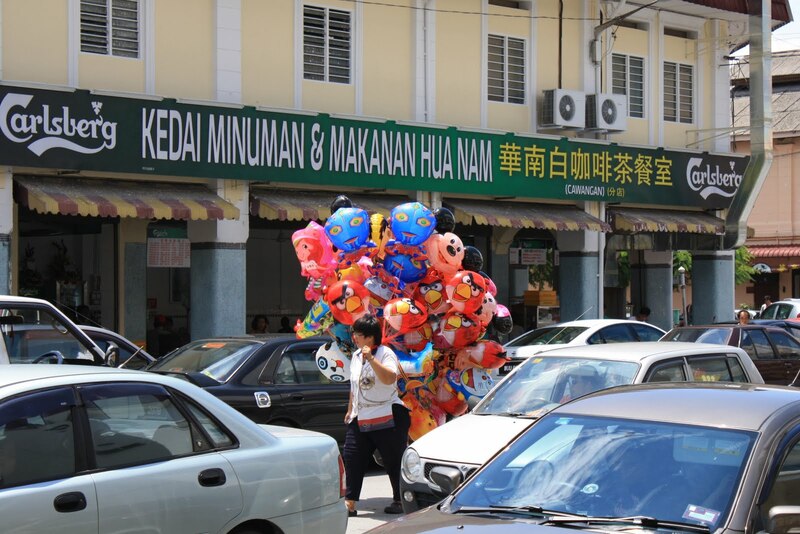 As there are only handful of shopping malls in Ipoh, they usually get crowded at this time. From the fully occupied car park, obviously Kinta City is one of the hottest spots attracting Ipoh citizens & visitors. 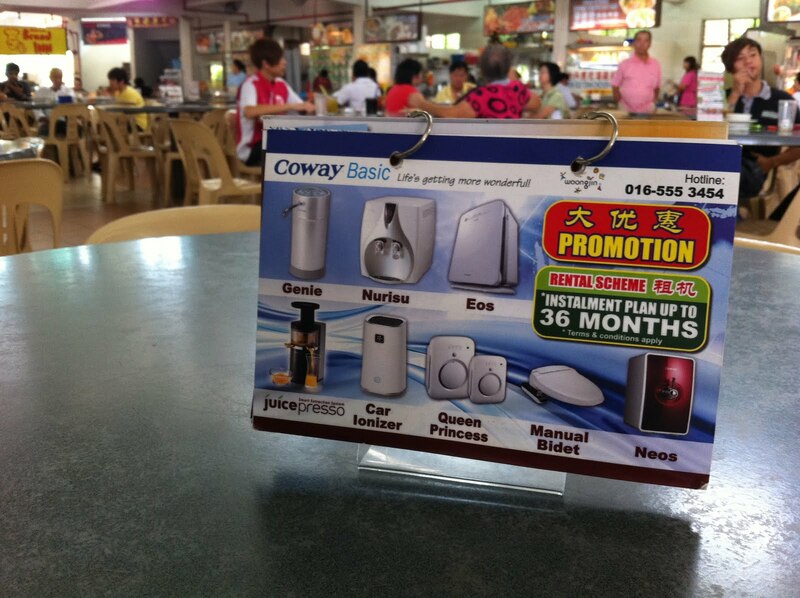 Advertising on eating shop & food court tables isn't a new idea. It used to be a piece of printed poster pasted on the table. However, it is quite limited space to advertise more details & not so flexible for updating latest post. This kind of desktop advertisement had been disappearing for some time and here come a new style, as seen in this photo. Flipping cards are placed on tables. I guess it will provide sufficient information on product or service & updating new advertisement can be done anytime. 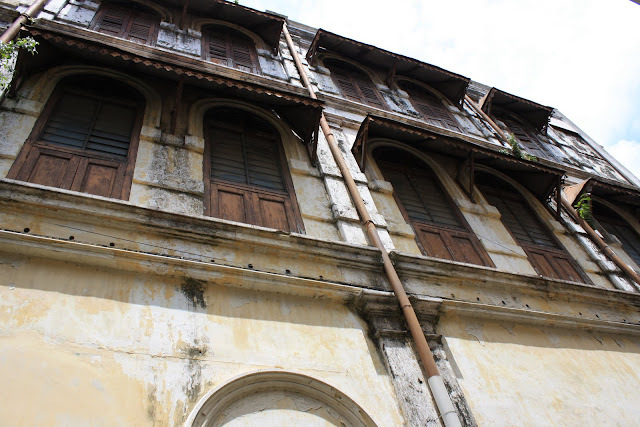 When talking about preservation of heritage building, safety must be taken care too. Constrcution requirment at a century ago might not consider the building robustness after hundred years. 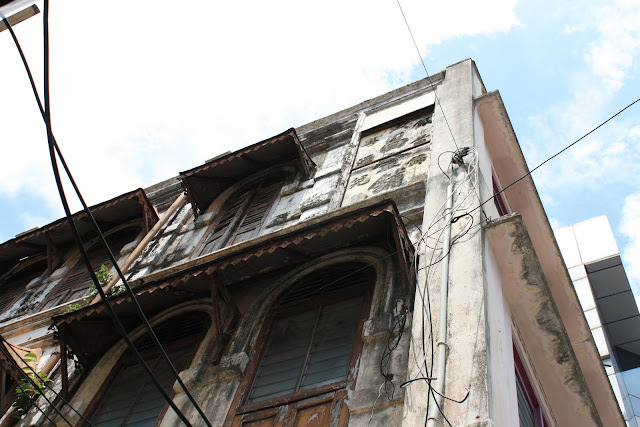 We can see some buildings started to deform & leaning wall like this shoplot is usually found. Hopefully something will be done by the owner before any unwanted tragic incident happens. 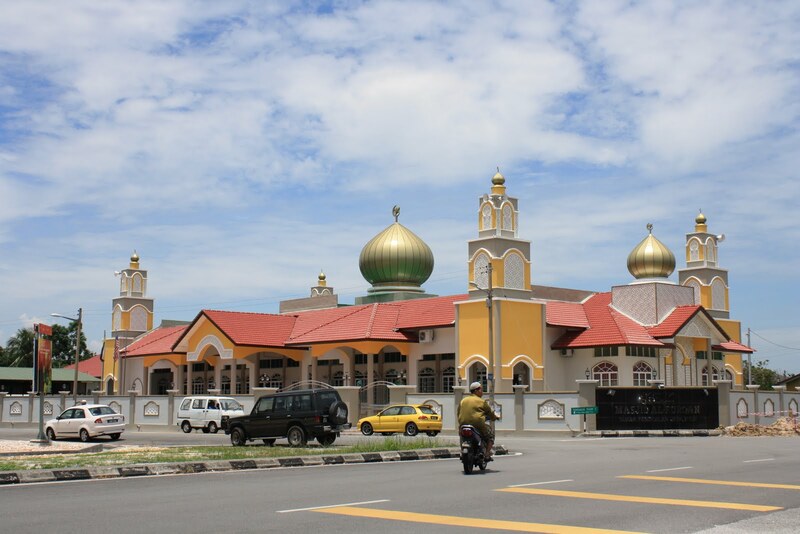 This mosque in SPPPK Housing Estate has just been renovated & looked beautiful. It is called Al-Furqan Mosque. 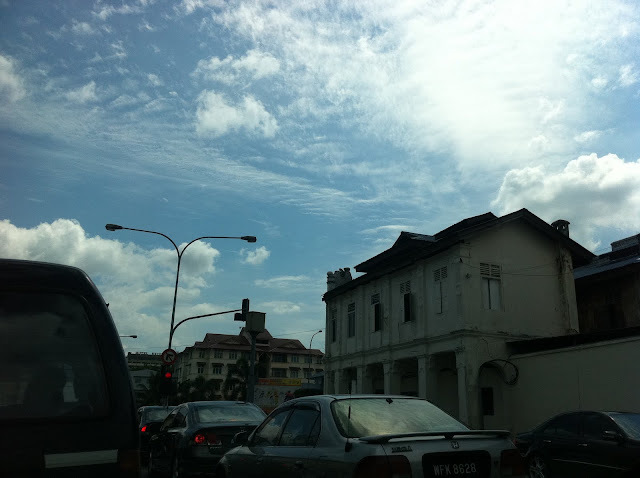 I find it so attractive especially under the nice blue sky with clear white clouds. 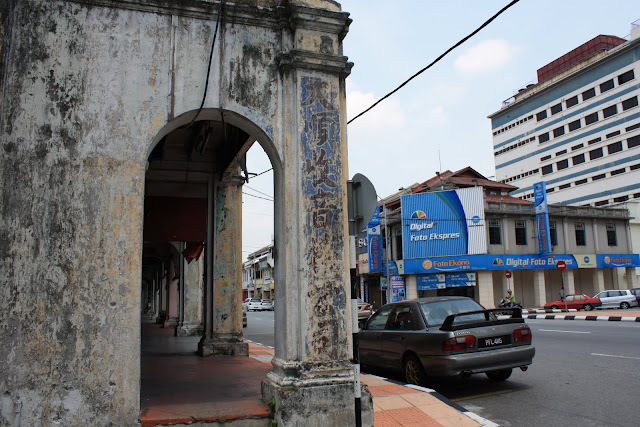 The faded paint at this pillar probably can tell us how long the shoplot has been left vacant. While I was thinking this radio shop is no longer exist, I am surprise to find it has moved to the opposite row, which seen in background of this photo. By the way, the building occupancy is quite poor along this part of Anderson Road. The corridor always quiet day & night. 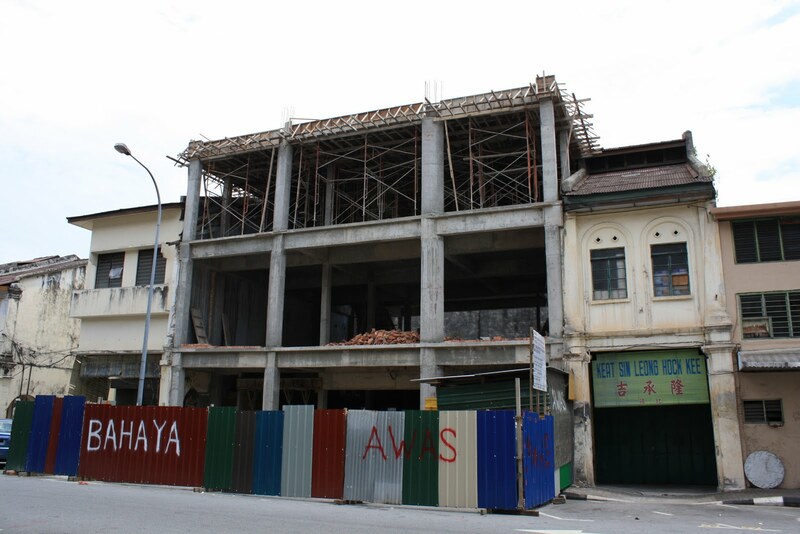 Citizens of Ipoh are all quite concern about whether this shopping mall will complete according to schedule. Since the last post about its status in July, it seems the work is progressing smoothly & the building is now growing to more than half of its planned height. To complete & open to public by February 2012, it still need some more effort & hard work. It had been talking for years, finally work of expansion started at Ipoh's Sultan Azlan Shah Airport. 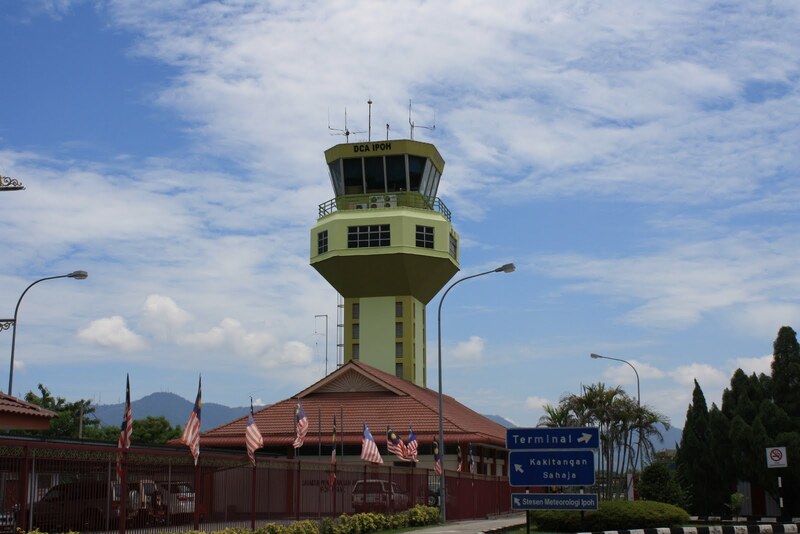 Despite argument in the community of whether to move this airport to a farther location from Ipoh city center to enable the city's high rise building development & build it bigger for international flights, or to slightly expend it in the highly populated area, the government decided to proceed with the latter. 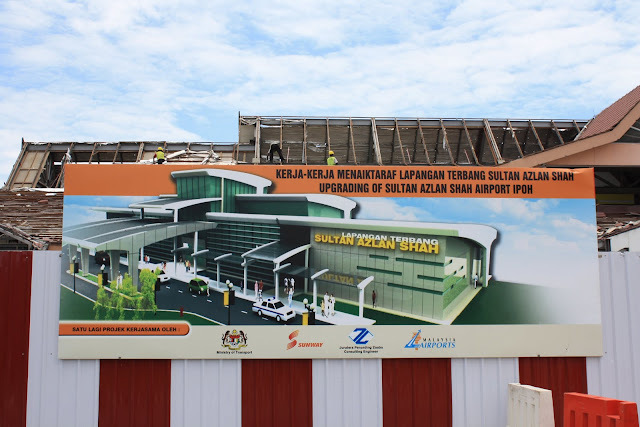 To give way for renovation, more than half of the airport terminal is closed & is operating in a poor condition. Hopefully the construction can be completed soon & appear in a new look just like the picture displayed at the site. Anyway, I believe the control tower will remain unchange. 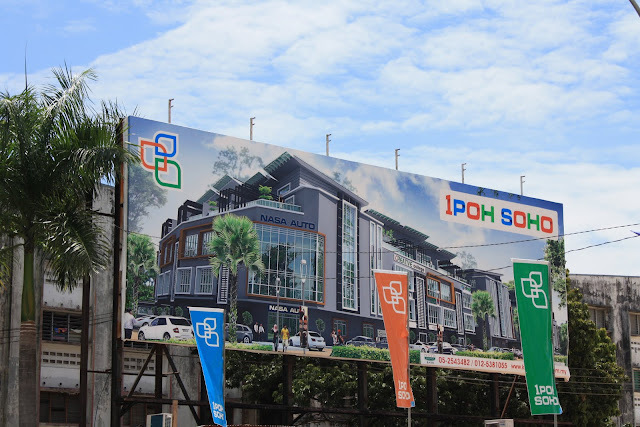 A new properties development in downtown, Ipoh SoHo by Kinta Saujana, may introduce a new concept to remain population in city center. In the past 2 decades, people are moving out from downtown seeking for more spacious living environment & avoiding congestion in the city. 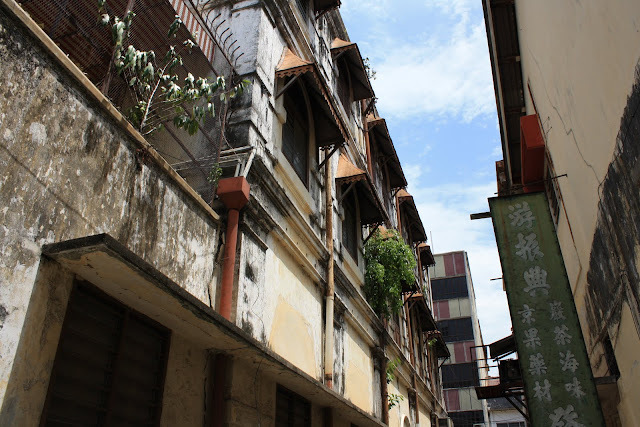 It had caused Ipoh city center become a dead town at night. The Ipoh SoHo project would promote a combination of living & commercial building in the heart of city. 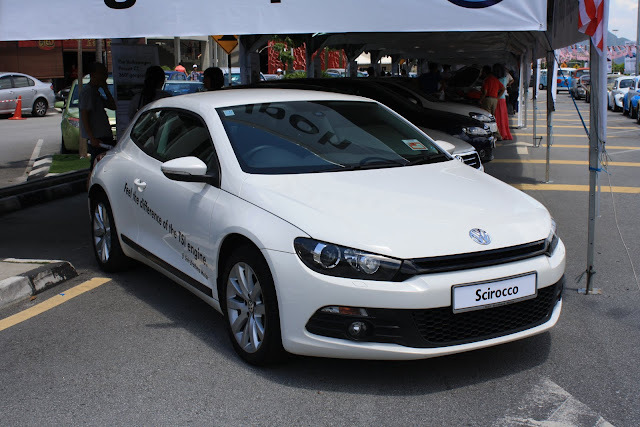 If the concept works for Ipoh, there may be more similar projects in future will copy the concept. 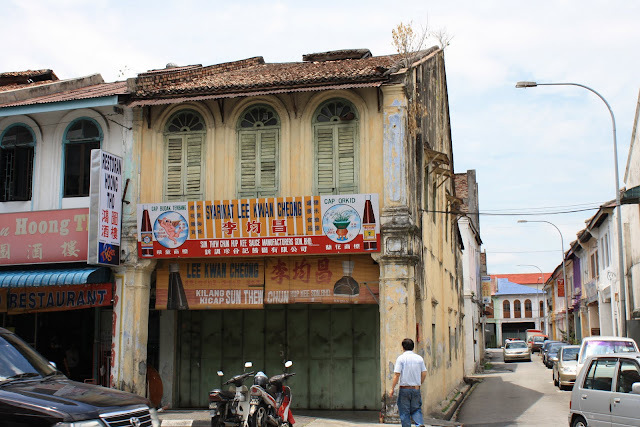 Furthermore, current old shoplots which was designed in the same way might also be restored to accommodate needs of modern day's living & commercial style. If you remember one of my post in April about an old board in front of Lido Cinema that used to advertise the latest showing movie, it is not gone with only the concrete pillars remained. There may be no intention to completely remove all structure because the pillars are re-painted. Perhaps a new board will be put on & it continues its mission to advertise, but not movie anymore. I can see the work to bring this building down is going on. 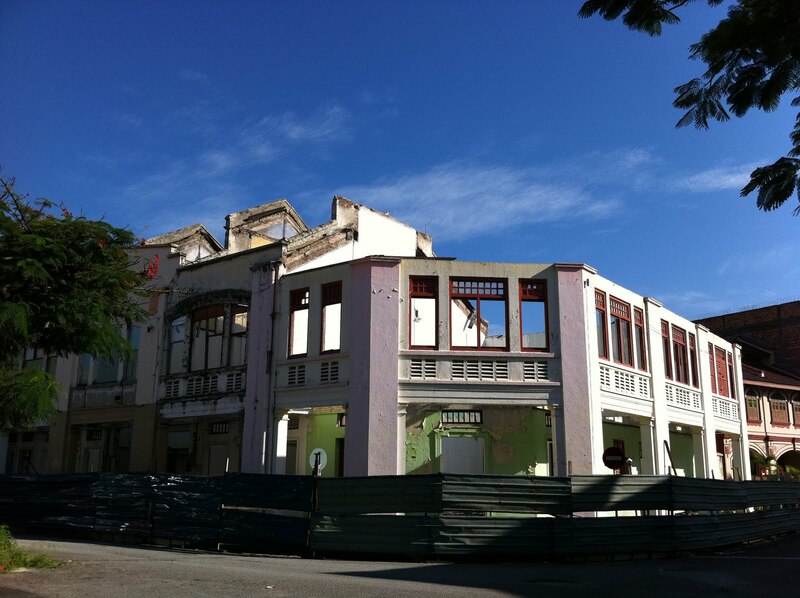 Since the last photo captured in June, the roof is already removed & part of the wall is being taken away. This is now an empty structure with only the skin remains. I have no idea about its fate; will it be completely demolished or the outer surface will remain? 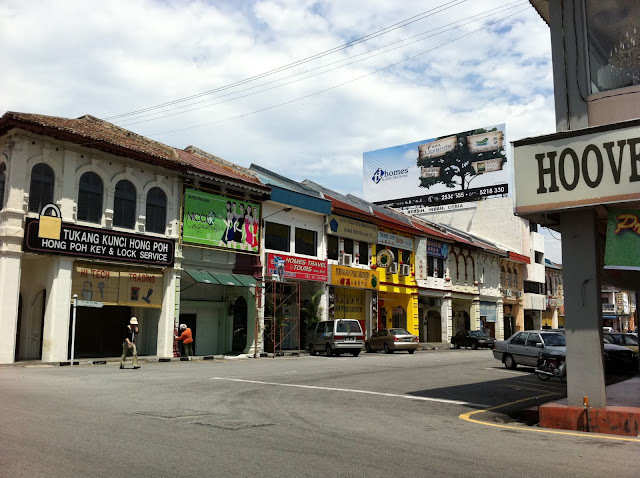 One of the busiest road in town, Yang Kalsom Road, is seen with long queue again in front the traffic light of Hugh Low Street junction. The weather in past one week tend to rain in the afternoon. Usually the next morning would be clear & sunny. Having coffee or tea together with toast, snacks, or oriental dishes is your favorite? 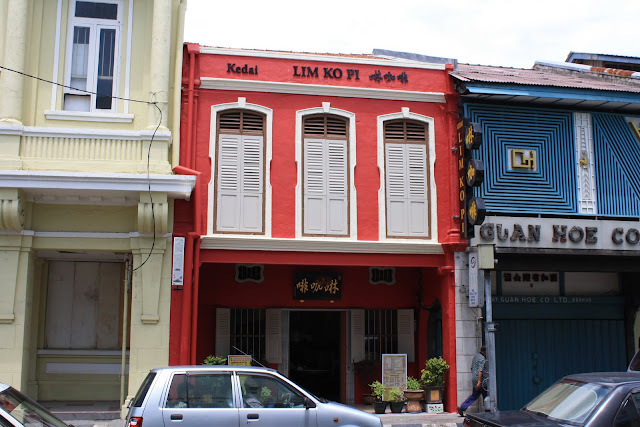 Now you can enjoy it in a Lim Kopi cafe in Hugh Low Street, right at the oldest part of Ipoh ("Lim Kopi" in local Hokkien dialect means drink coffee). 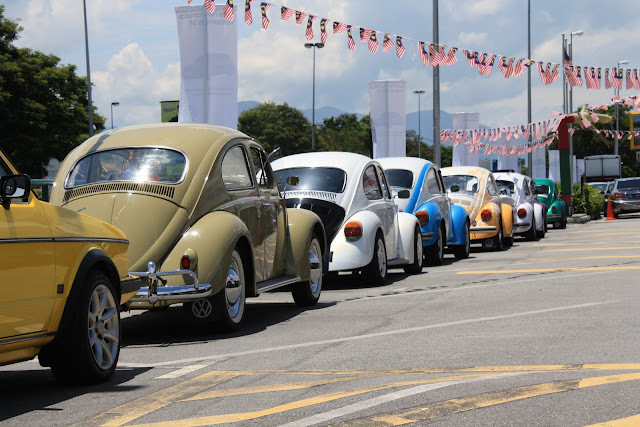 By keeping the building structure, the interior is made to be nostalgic but comfortable. You may really like to have your cup of coffee right here. 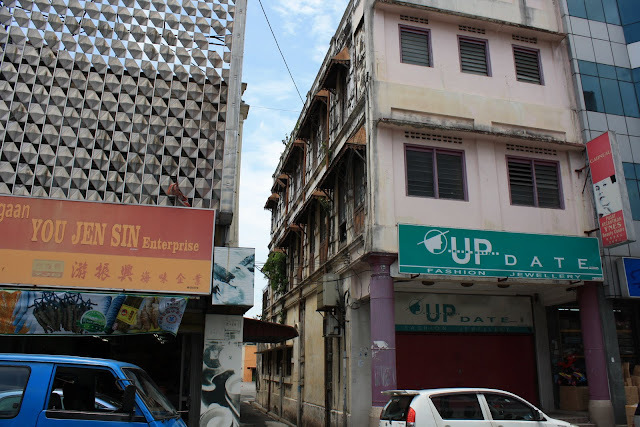 I also heard the adjacent Oversea Building will be converted into a boutique hotel by the same owner of this cafe. What a nice idea!! 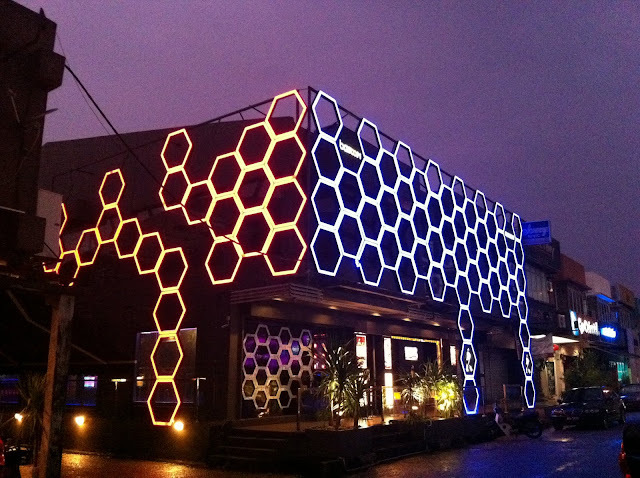 Lighting decoration is getting more popular nowadays. Pubs & bistros in Ipoh Garden East always keeping themselves attractive by putting on new look. 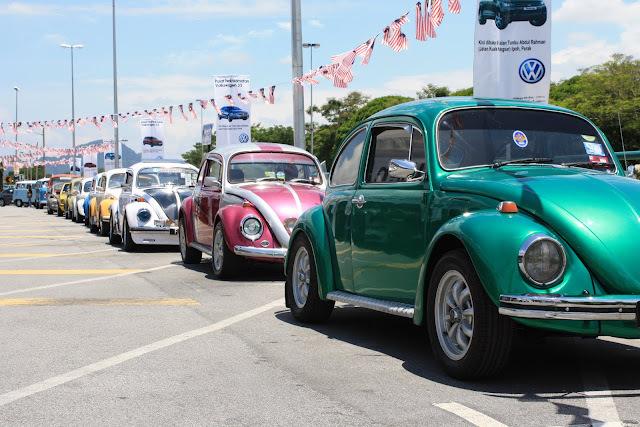 Colorful running lights are now here & there in the city. This bee nest is one of my favorites. I captured the last scene of 3 old shops at Treacher Street in June 2010 before it was torn down. Now there is a new building which is completely inharmony to the neighbouring old buildings under construction. 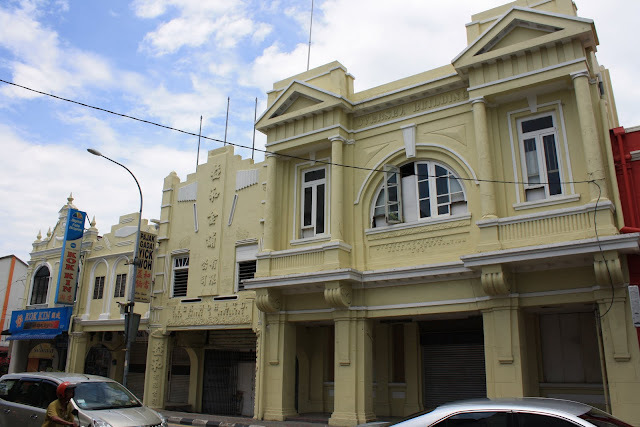 Despite some restoration project in town that intend to preserve original structure, or at least its appearance, we still find many are not appreciating the value of heritage buildings. Yau Tet Shin Road was once well known as hawker street back in 1970's~80's. However, since Ipoh City Council forced to relocate street hawker in 1986, it had been quiet for some time. Except few of them moved in to shops and continue their business here, most are now based at Rainbow City hawker street. Until recent years, Yau Tet Shin Road at night back to be a popular spot for food & local product. 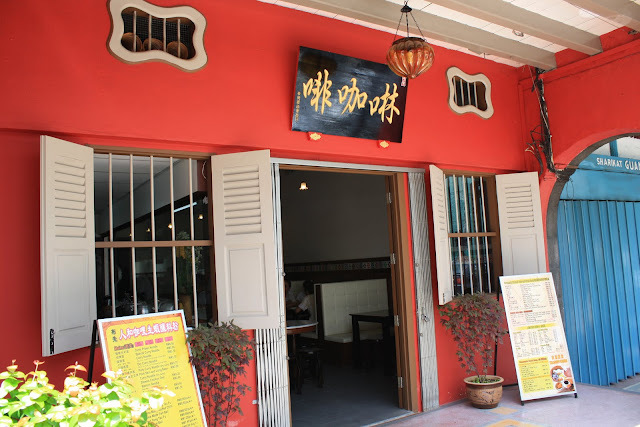 Apart from the famous beansprout chicken restaurants, there are also restaurants of Cantonese & Teochew food. The street become so congested at night, especially weekend & holiday eve. It's a very different scene from this day time condition. From the previous post of MH Hotel on February, it is still chasing time to grow higher. Now it has reached top level for some time and interior works should be the focused task now. We should expect the grand opening by early next year, probably to catch up with the first festive holidays of Chinese New Year.